This spring, we returned to the Santa Rita Mountains in southern Arizona. 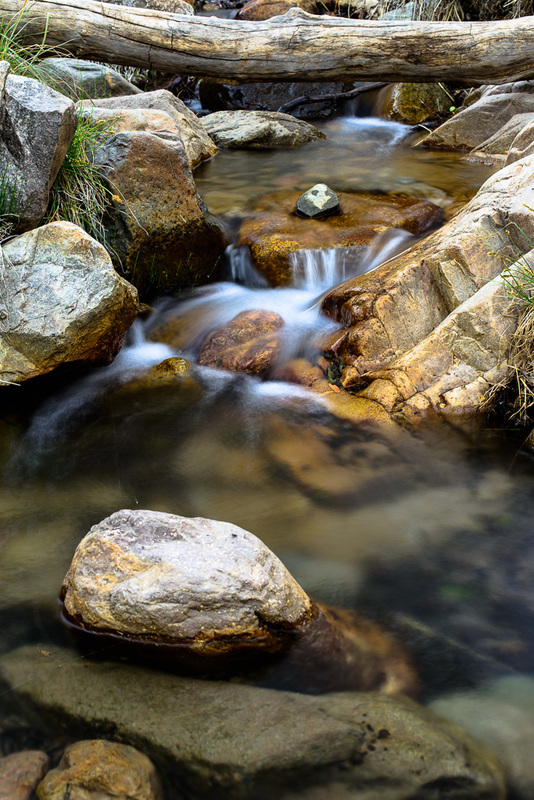 Tucked away on the western side of the range, about halfway between Tucson and the Mexico border is the quaint oasis of Madera Canyon. Madera Creek provides an oasis for wildlife surrounded by the vast Sonoran Desert. The Santa Rita Mountains are known as “Sky Islands”. Rising abruptly from the Sonoran desert floor, these mountains reach heights of nearly 9,453’ at their highest point, the summit of Mount Wrightson. This dramatic topography creates a climate that provides habitat for a rich array of wildlife. On our previous trip, we had hoped to see a white-nosed coati. The coati (co-AH-tee) is a member of the Procyonid (raccoon) family. Their range extends from Columbia through Central America and just barely reaches the United States in southern Arizona and New Mexico. 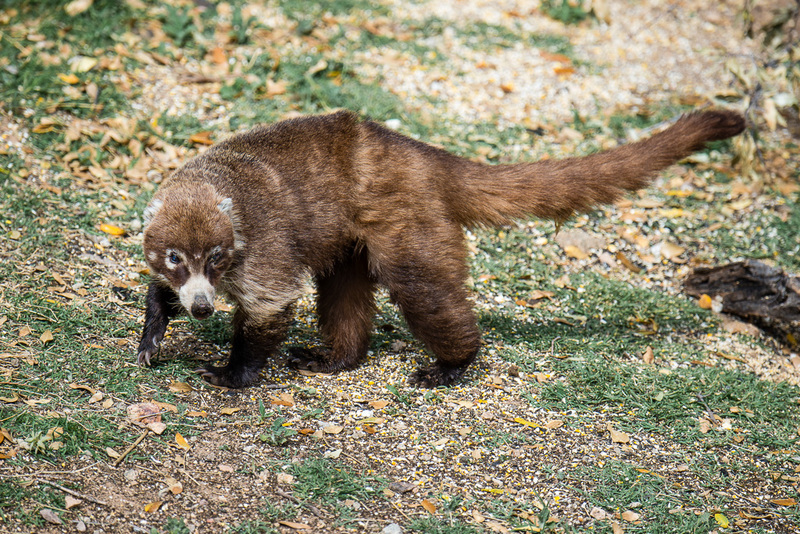 Although we struck out on the coati in 2014, we had a wonderful time and decided to return for another chance. Madera Canyon is probably best known as a birdwatching destination. 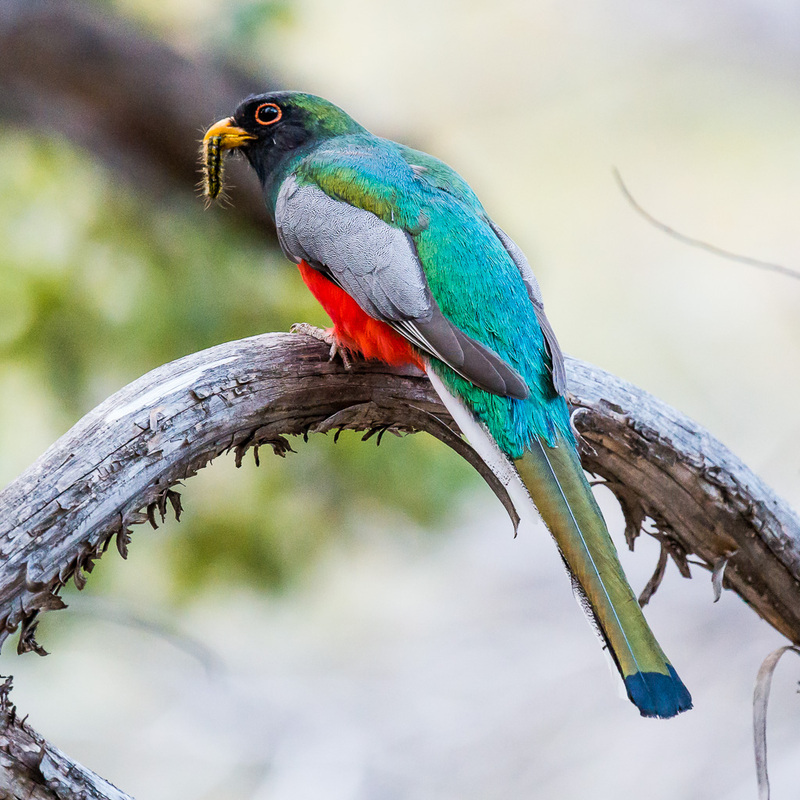 Every spring, birdwatchers travel from around the globe for a chance to see the elegant trogon when it visits southern Arizona to nest. The trogon is a beautiful and exotic bird. It is also rare, with less than 50 nesting pairs estimated in the United States. My trogon sighting came one evening while I was photographing a stretch of Madera Creek flowing over some rocks. Off in the trees, I kept hearing a noise that sounded a bit like a barking dog. There had been no cars at the trailhead when I left, so I knew it was unlikely to be a dog. Not knowing exactly what it was, I set off to investigate. It didn’t take long to locate the source of the noise – a brilliant male elegant trogon was perched high in a juniper tree. I would have been content just to see this sought after bird under any circumstances, but after ten minutes or so, he caught a caterpillar and landed about 20’ away, granting me a wonderful photo opportunity. An elegant trogon about to enjoy a caterpillar. Coatis are one of my favorite animals. Between their long tails and flexible snouts, there is an animated characteristic about them. Since they are diurnal and I had seen some photos on the internet taken in Madera Canyon, I felt like my odds of seeing one were pretty good. A white-nosed coati visiting the Santa Rita Lodge. Between my two visits, I’ve hiked over 50 miles of trails in Madera Canyon, culminating in a hike to the summit of Mount Wrightson. I really enjoyed the trails and the views, and saw lots of neat things, but no coatis. Ironically, on the last day of our trip this spring I spotted my first coati out the back window of our cabin as we were packing up to leave. It was the same cabin we stayed in on our first visit and I remember on our first day commenting on how cool it would be to see a coati right out our back window. The coati eventually found his way to the bird feeding area where he rooted around for a bit and then took a nice long nap in a nearby tree. It was a great ending to a great trip. 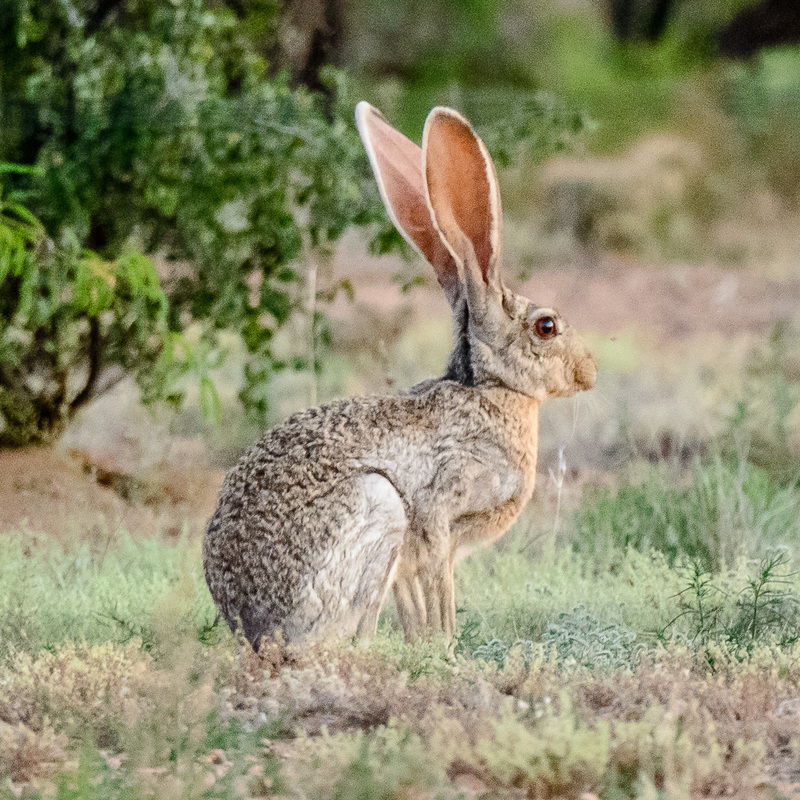 The antelope jackrabbit is among the largest of hares. Coues’ white-tailed deer are commonly seen in Madera Canyon, particularly around the Bog Springs Campground and near the White House Picnic Area. The Coues’ is a subspecies of white-tail adapted for desert survival and are much smaller than their corn-fed Midwest cousins. Antelope jackrabbits, one of the largest hares in North America, can be seen along the road between the mouth of the canyon and Continental. The best time to see them is at dusk – keep an eye out for their enormous ears. The pig-like collared peccary, also known as javelina, can also be seen through this area. Both times I have seen them, they have been crossing the road within an hour or two after dark. They tend to sleep off the hottest part of the day somewhere in the shade. Madera Canyon is home to a multitude of other mammal species, especially the nocturnal variety. 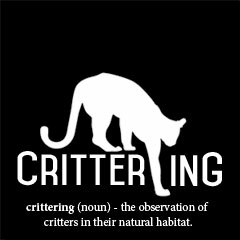 Ringtails are known to patrol outside the cabins during the night. Four species of skunk – western spotted, striped, hooded, and hog-nosed, are all known to occur in the Santa Rita Mountains and sixteen species of bats have been recorded in Madera Canyon. Elegant trogons and white-nosed coatis aren’t the only tropical inhabitants of the Sky Islands. The jaguar, native to Arizona, was believed to be extirpated until being rediscovered in 1996. Since then, up to six male jaguars have been documented in southern Arizona, including in the Santa Rita Mountains. Ocelots also roam the Santa Rita mountains. The ocelot is a small tropical cat with a beautiful spotted coat. Like the jaguar, it is native in Arizona, which makes up the northernmost extent of it’s range. Both jaguars and ocelots are federally endangered species. Looking down from the summit of Mount Wrightson and pondering the thought that I may be sharing its slopes with an ocelot or even a jaguar is a thrill. 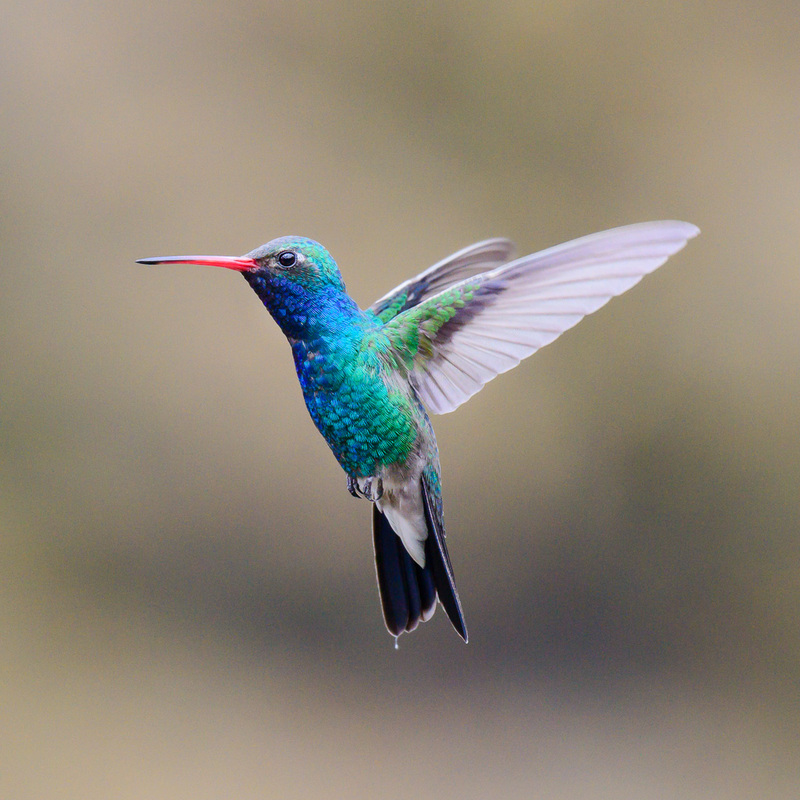 These species require large tracts of unbroken habitat to thrive and face increasing pressure from development, mining, and other forms of fragmentation. Hopefully, they will continue to find their home in the Sky Islands of southern Arizona. A broad-billed hummingbird, one of the many hummingbird species frequently seen in Madera Canyon. Beautiful photography and informative. Thank you.